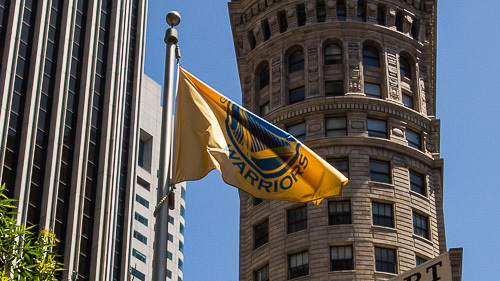 The flag flew brightly over the Montgomery BART station in San Francisco before an estimated half a million Golden State Warrior fans gathered around Lake Merritt in Oakland to cheer the NBA champs today. The Warriors overcame a 2-1 disadvantage, winning three straight against the Cleveland Cavaliers in the best-of-seven series, to capture the crown. And they did it with unselfish ball-handling on offense creating space on the floor and a suffocating team defense executed by a smaller but faster group of guys. The Eastern conference champion Cavaliers didn't get to the Finals by accident, though. They took the Warriors into overtime in the first two games in Oakland, winning the third outright despite key injuries before the Warriors made their run. It was one of the more dramatic Finals in years and garnered an unusually broad television audience, the most since Michael Jordan's Bulls captivated the country. It's a happy day for Oakland, for the Warriors, for the sport of basketball. And we're taking just a moment to toast all three.